Use Google Analytics to analyze where your Social Media traffic comes from and how to improve social visitor conversion. Whether you’re marketing on social media as an individual or as a brand, understanding how your content is faring on social media is a critical part of a content strategy. However, it’s not always easy to do - you need to perform an “audit” to find all of the content you care about and get all of the necessary web and social analytics data into the same place. This usually means exporting all of your Google Analytics data and importing it into a spreadsheet, then repeating the process for the all other data services that you use. 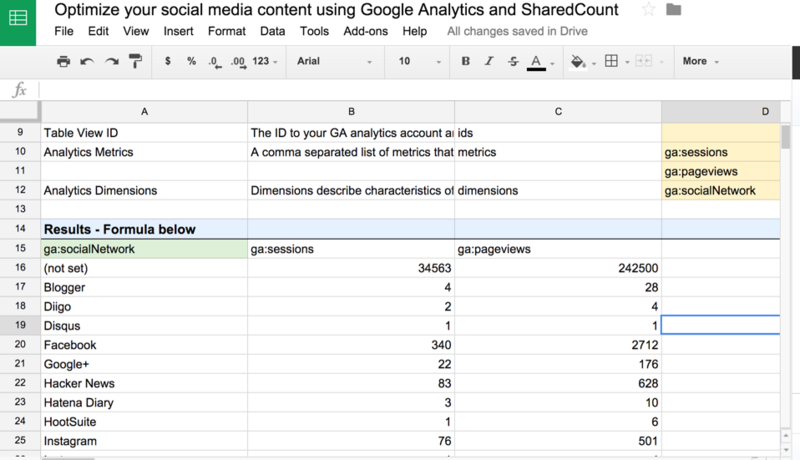 Google Analytics can provide some great insights into the performance of your content on social media. First, let’s look at which social networks are sending you the most traffic so you can focus your efforts accordingly. Get started by opening a Google sheet, then the Analytics Report in the Blockspring Console. Create a report using the metrics Pageviews, Sessions, and the dimension Social Network, and insert it into a new sheet. You’re now in possession of some valuable data about your website’s social media traffic. It’s easier to make sense of the data using a visualization or conditional formatting to look for outliers or other actionable opportunities. Let’s copy the data into another tab so we can perform this analysis using conditional formatting, which can be found in Format -> Conditional Formatting… We’re going to apply a color scale from white to green, and set the midpoint explicitly to 50th Percentile. You can quickly see that social media sources like Pinterest, Google+ and Pinboard don’t amount to much of our site traffic, while Facebook, Linkedin, Hacker News and Instagram are much larger contributors. In addition to understanding where traffic is coming from, you can quickly add additional metrics like Goal Completion to start to understand the value of the traffic from each source. Another great place to investigate is the performance of pages that visitors land on from these Social Networks. Create a report in a new tab using the metrics Sessions, Bounce Rate, and the dimensions Social Network, Shared URL. Use Filter to remove any unset Social Network values. We can investigate the resulting data the same way we did above by copying it into another sheet or making cell references, but let’s use a pivot table to allow us to filter more easily. This will let you eliminate landing pages with a small number of sessions that might throw off the analysis, or focus on a specific Social Network. We can use this data to identify the landing pages to target for improvement based on high bounce rates or other factors - specifically as they pertain to Social Media visitors. Now that you’ve gotten a baseline feel for how Social Networks are delivering traffic and how users are interacting with your content, we can use the data generated here by Google Analytics to identify your top shared content and gain insights into your content strategy with SharedCount.